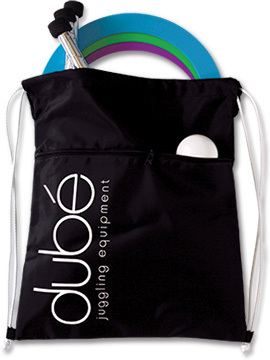 Our nylon drawstring prop bag, silkscreened with the dubé logo, is a perfect lightweight solution for carrying your juggling equipment. The white nylon drawstrings pull to convert the bag to a hands-free back pack. The main section will hold several clubs or other props. It is also large enough to hold standard size rings. A zippered front compartment keeps smaller props separated and allows easy access - ideal for holding balls. #2151 Dubé Prop Bag $14.95 ea.